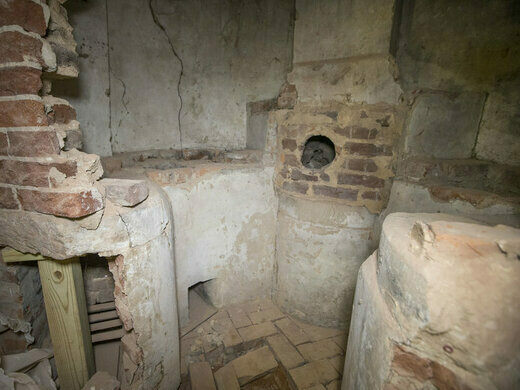 Nestled in the ground floor of a UNESCO World Heritage Site and sealed behind a brick wall since the 1850s, a recently unearthed chemical hearth at the University of Virginia may be the oldest instructional furnace for a chemistry course in the country. Discovered during a multiyear renovation project in 2015, the chemical hearth on the bottom floor of the University of Virginia’s original library (known as the Rotunda) is now being trumpeted as “maybe the oldest intact example of early chemical education in this country” according to the school’s senior historic preservation planner. When a renovation crew discovered a surprisingly hollow space in the lower walls of the Rotunda, they realized something was askew. Excavating further, they discovered a well-preserved chemical hearth dating back to the 1820s. Subsequent research discovered back-and-forth correspondence between the University’s Professor of Chemistry John Emmet and the University’s founder, Thomas Jefferson. The two men discussed the need for expanded space for Emmet’s chemistry courses. As a result, the hearth was installed in the north wall of the building’s Lower East Oval Room. The installation included multiple fireboxes (one for coal, one for wood), underground tunnels, and hidden flues. Emmet’s early death at age 47 is partially attributed to his maladies from experiments gone awry an inhaled fumes, indicating the hearth was in frequent use as an instructional tool or for private research. The hearth’s discovery surprised in part due to the fact that the Rotunda has been rebuilt on multiple occasions over the past two centuries. The hearth was likely sealed in the 1850s as the school added an annex to the Rotunda with expanded laboratory space. However, an 1895 conflagration torched the annex to the ground and nearly burned the entirety of the Rotunda. 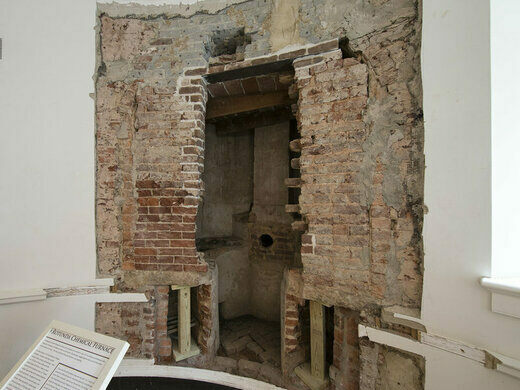 Ironically, as the majority of the Rotunda burned to the ground, the most well-preserved section of the ground floor was this chemical hearth, a vestibule designed for heated flames. Rebuilt over the next few years, the building stood largely unchanged until another full gutting in 1976 as the University attempted to restore Jefferson’s original design. Neither rebuilding process discovered the hearth nor indicated any knowledge of its presence until the current renovation project. The University’s Rotunda restoration team decided to preserve the hearth and surround it with educational materials for public viewing upon the building’s reopening. Though the hearth will again be sealed off, this time it will be through transparent glass rather than the opaque bricks that have hidden it since the early 19th century. The Rotunda is open daily from 9 am to 5 pm.Historical tours are offered free of charge and meet daily at 10 am, 11 am, and 2 pm in the Rotunda's Lower East Oval Room.